Josh Ewing, director of the Friends of Cedar Mesa, examines some pottery sherds in a midden in the Bears Ears National Monument. This area is rumored to be likely to fall outside the boundaries of the monument that's the White House is drawing up. Items donated by a local family are hard to put into context without accompanhing information about where they were collected. These pieces have joined more than a million others in storage at the Edge of the Cedars museum in Blanding. A local patriarch had collected the artifacts long ago, Till said. And when he passed away, no one could say where they’d been found. The curator thought they might be more than 800 years old - up to 1,000-years-old, but he couldn’t be sure. If he knew where they were originally found - at a kiva, for instance - the pieces could tell him lots more. Jonathan Till shows a ball of yucca twine, one of the extraordinary objects at the Edge of Cedars Museum in Blanding. He says objects like these offer insights into history, and local Native American tribes help scientists understand how they fit into ancient human stories. Bears Ears is full of meaningful snippets like this. Ruins, graves, pottery, tools, even trash heaps - archaeologists say there could be over 100,000 significant sites where these objects help tell a story, the human story. The land around Bears Ears holds stories unfolding over more than 12,000 years. What we believed. Why we fought wars. How we coped with wild swings in the climate. While the heart of the Bears Ears debate is about preserving human history, the national monument fight isn’t just about ruins. It’s also about the important stories scattered across San Juan County’s landscape, archaeologists say. Till says he’s not concerned about the national monument’s boundaries. What does worry him is enforcing laws and educating visitors, regardless of the monument’s size. He wants the necessary resources dedicated to preserving stories, their pages left intact. The Trump administration has said conserving the cultural resources is important, but it’s also recommending trimming the monument’s size. Blanding historian Janet Wilcox wants that, too. History, including Anglo, ancient and Native American, is a local tradition, Wilcox says. In fact, government researchers and universities used to pay locals to dig up pottery and other artifacts. Janet Wilcox is a founder of the history magazine, Blue Mountain Shadows, which chronicles history in San Juan County. She says protect modern traditions is important, along with preserving ancient history. Pot-hunting is illegal now, and Wilcox agrees artifacts should be protected. But she calls it extreme and impossible to try to preserve everything -- especially on 1.3 million acres. Like many people who live here, Wilcox says restrictions on the monument shouldn’t sideline other local traditions, like hunting, ranching and cutting firewood. Josh Ewing is taking me into places in Bears Ears that aren’t found on maps. We head down a dirt track, over slickrock and we come to a lush, redrock canyon. Patterned pottery sherds litter the sand. A stone-block ruin is tucked high in a sandstone alcove. Petroglyphs are scratched into a wall nearby. The Antiquities Act says monuments should include the smallest area needed to protect the objects. This monument might seem vast, Ewing says, but it fits that definition. Hundreds of archaeologists pressed for the monument’s creation last year. This year the Trump administration is considering smaller boundaries. The White House is getting advice from the state of Utah, which used to keep two field archaeologists on the payroll to help interpret cultural landscapes like this. But they were laid off years ago. So, as the Bears Ears question comes into sharp focus, it not clear if anyone drawing the new maps can hear when the pages of history are being torn away. 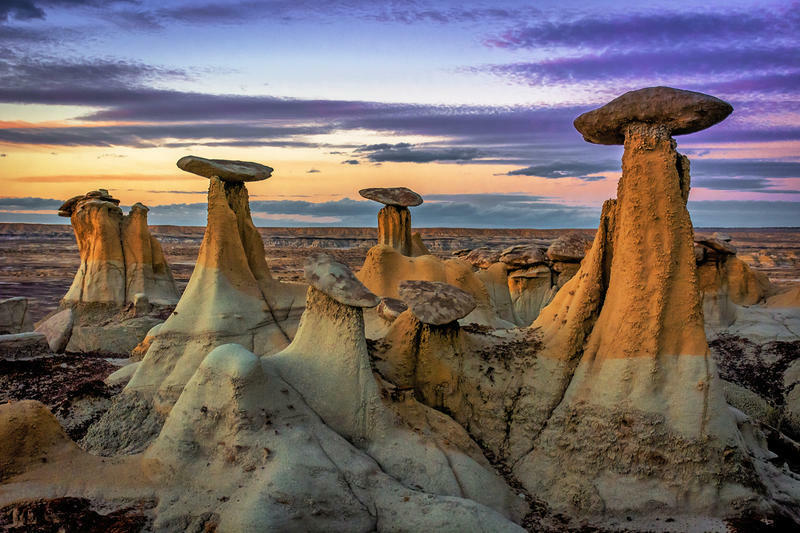 Garfield County commissioners are set to look at a resolution Tuesday to reconsider the size and shape of the Grand Staircase Escalante National Monument. 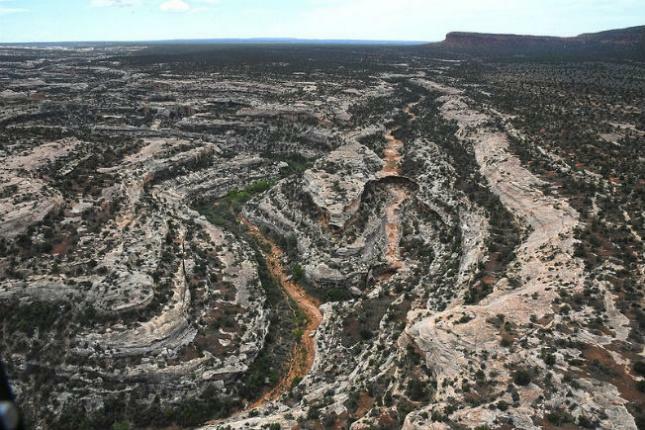 Utahns -- from Senators to local ranchers and archaeologists -- have been asking to show U.S. Interior Secretary Ryan Zinke the state’s newest national monument. He arrives Sunday to carry out President Donald Trump's recent executive order to review monuments, starting with Bears Ears in San Juan County. Albert Holiday was standing at a remote junction in Utah’s red rock desert. He was part of a group of Utah Dine Bikeyah members chanting in Navajo at passing cars: “Where is Zinke?’ and ‘Go Bears Ears!” They were hoping to catch the attention of U.S. Interior Secretary Ryan Zinke on his way to another meeting.